Sharing our love for healthy, sustainable agriculture practices. Last week nearly two hundred pounds of goat meat arrived in our freezer. We were able to get it USDA inspected at a newer local facility in Sturgeon Lake, MN that we really enjoy. Of course we took out a package right away and Mathew cooked up a rack of goat ribs. It was savory and satisfying! We found our recipe at mymidlifekitchen.com. With only five ingredients, it was simple, quick to prepare and warmed the house nicely since it cooked for three hours. Perfect for a winter day in Minnesota! Check out mymidlifekitchen.com for the full recipe and how to prepare it. Goat meat is a great source of lean protein, B-12 vitamin and iron. It is also quite versatile if you enjoy a variety of tastes and flavors. According to a Universiy of California blog post, “What is the world’s most popular meat?” goat meat is actually the most commonly consumed meat in the world, with 63% of the world’s population eating it. This article also has a nutritional comparison of various meats, see below. We look forward to trying Indonesian, South American, French, Asian, Middle Eastern and African recipes. Each has their own special spices to add. Please share your favorite recipes with us so we can share them with the world! Harper, John M. “What is the world’s most popular meat?” http://ucanr.edu/blogs/blogcore/postdetail.cfm?postnum=3679. November 3, 2010. Give us a call or send us an email to order some today. We’d love to deliver some Goat Chops, Goat Shoulder Roast, Goat Leg Roast, neck or ground meat. direct to you. Our current price is $10.00 per pound. Unexpectedly, we have half a hog still available. It will be brought to Glen Meats on December 7th and ready to be delivered to you (Minnesota) around December 20th. If you or anyone you know are wanting some Christmas ham or wanting a great gift for a highly cherished family member, please let us know. Until then, our hogs will be happily running about the pasture and eating non-gmo and soy-free feed to their hearts delight. They will also likely put on a little bit of lard that would make an excellent pie crust and lardons. We are so proud of the finished product and very happy with the way our animals our treated. Please consider half a hog today. I can’t believe it’s been a month since I’ve updated you all on farm living. Some new developments have us excited. Our newest increase is that we will be getting a female Great Pyrenees today and hope that she and our male will do well to guard our growing goat herd. We also hope to offer livestock guardian puppies in the future. We’ll let you know if Furry and Juniper (Juni) get along well together. Another cause for elation is that we have chicks hatching today. Yesterday, Moe and Fiesty were born. Last month, we had seven born in our incubator. This has been such a fun process for us and we hope to get some good laying hens for future egg production for our own use. Last months chicks; Hawk, Big Goldie, Little Pepper, Cookie, Little Goldie and Speckled Head, are doing well and love following me around the yard. I have also taken up the challenge of milking our Alpine goat, Ivy. 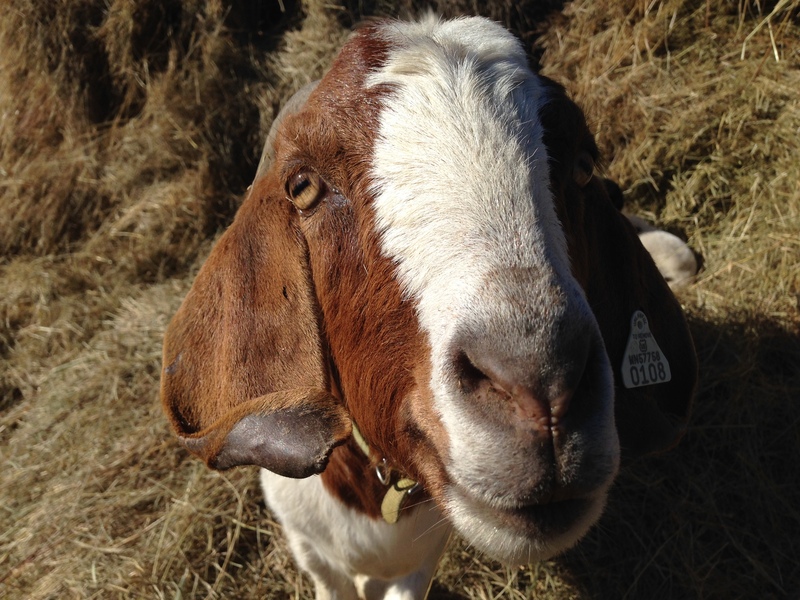 She has been providing us with over a quart of nutritious raw goat milk each day. In early June, we will likely start milking twice a day (a whole new challenge). This weekend, we may even make goat milk ice cream. We have enjoyed the flavor and our many guests have enjoyed a little taste too. Mat’s new chicken tractor design is complete. As a result, moving our pastured chickens twice a day is now enjoyable. A smaller number of chickens has resulted in cleaner, healthier birds so far. If a chicken can be beautiful, I have to say that these are. I have actually said it to them more than once as I’ve seen them this year. Maybe I’ve been on the farm too long. Our pigs are growing strong enough and big enough for our youngest boys to ride them. These two boys have become more daring with age. I don’t think we’ve mentioned that we have three bull calves born last month. They were a surprise since we were told our Scottish Highland cows were bred to give birth in June. We are happy with our healthy and fluffy and soon to be steers. They are growing fast. Mat split one healthy bee hive yesterday and has another out there. Hopefully, this will be the year to brag about when we actually get honey to market. Lastly, our maple syrup season went well. We weren’t so sure at first and it was hard work. At $.25 an hour, Mat doesn’t get paid much for his time with this product, but we enjoy the stuff so much that it’s worth it. That’s it for now I suppose. Hope you enjoyed hearing about our busy lives. Sorry for the lack of pictures. I guess you’ll just have to visit and pick up some fresh food from the farm if you want to see this stuff for yourselves. 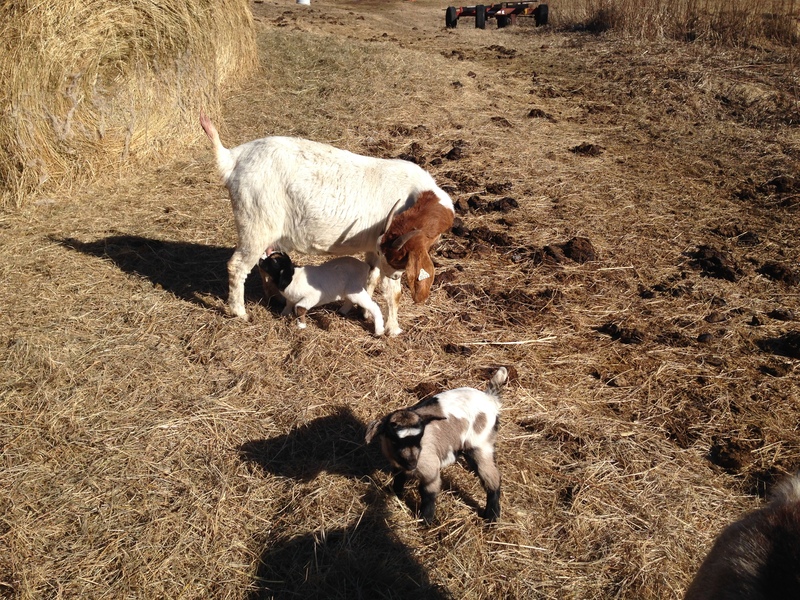 On March 23 we had our first triplets on the farm. 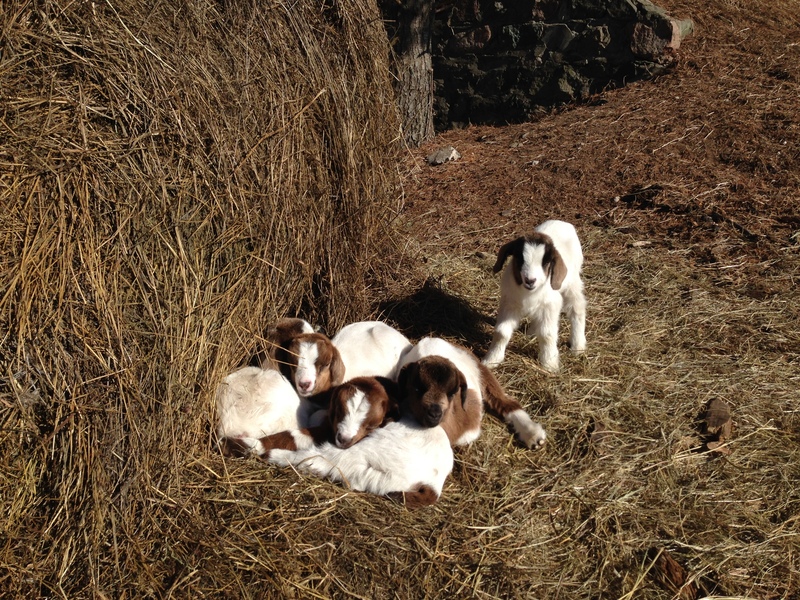 Thirteen Boer-Fainting goat kids were born within the next two weeks. We sadly lost two; both from triplet sets, one of those having been born with bowed legs. Now we have eleven frolicking kids roaming the pasture. Our Maremma Akbash dog has been an excellent midwife and nursery attendent. With our first arrivals, he jumped back and forth with excitement to tell us the news. Each time new babies have been born, he is right there to keep watch and nudge the kids toward their mom when they are lost. He has stayed close to the napping kids while the moms are on the other side of the large pasture and kept watch for golden eagles prowling the skies. What excitement we have had this year with our new arrivals. We have a few restaurants that have asked us about our goats so far and have a few friends from African and South East Asian countries that will be happy to have chevon (sometimes called mutton) for their next holiday meal. Finally we have hopes of keeping our customers satisfied. One last note to say that you are missing out if you can’t come see this youngsters this summer. They are a beautiful creation.